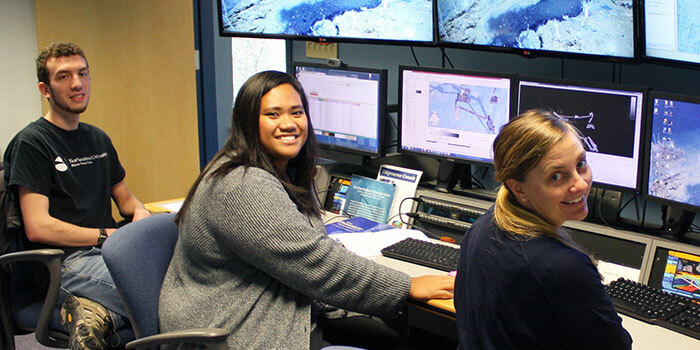 Explorer-in-Training Claudia Thompson is shown here with NOAA Office of Ocean Exploration and Research mapping lead Elizabeth "Meme" Lobecker and fellow Explorer-in-Training Brandon O'Brien at work at the University of New Hampshire's Center for Coastal and Ocean Mapping. Read the full text of Claudia's interview below to learn more about her experiences. For the first part of my internship as an onshore Explorer-in-Training (EiT), my duties included the processing or "cleaning" of the multibeam data that were being sent to shore during the Telepresence Mapping in American Samoa and the Cook Islands expedition and compiling everything (bathymetry, backscatter, and slope) to create our final masterpiece, which was the cumulative bathymetry coverage for American Samoa's waters. As for the second part of my internship, I was fortunate enough to join the rest of the mapping dream team onboard the Okeanos Explorer for the Musicians Seamounts Telepresence Mapping expedition out of Hawaii. My duties as an EiT onboard, other than the usual processing of multibeam data, included deploying Expendable Bathy Thermographs (XBTs) for calculating sound velocity, utilizing a sun photometer for measuring aerosol optical thickness, searching for any evidence of seeps in the water column through the FMMidwater software, and lastly, mastering the art of communication on the RTS. I am currently working on my Associates of Science degree in Marine Science at the American Samoa Community College (ASCC). We are currently en route to the Musicians Seamounts located on the northwestern part of the Hawaiian Islands. Frankly, I was both terrified and excited. Terrified at the idea of not being able to recall everything that I was taught a couple of months ago but excited to meet new people, sail across the Pacific Ocean, learn new things, and experience the life out at sea. So I guess you can say my excitement trumped my fear. Other than getting a little seasick here and there, my experience has definitely been incredibly awesome and life changing (sounds cliché, I know). Ever since I was a kid, I was always drawn to the beauty of the ocean and the mysteries it held, especially the creatures that inhabit it. I guess growing up on an island played a huge role in my interest for ocean science – being surrounded by the deep blue and all. Definitely getting to know everyone and their colorful personalities was rewarding enough for me. All those "talk story" moments I've shared with them over dinner or long days in the survey room when our software is not satisfied with our gummy bear sacrifice have been nothing short of laughters. Other than that, the only other thing I found rewarding was when everything didn't seem like rocket science anymore but rather just another simple task in the day of a mapper. What is the most unexpected thing you have learned? That miracles do exist. After the first couple of days into the cruise, it felt like I was never going to get a grasp on anything, but by the end of the week, I was going through everything in a breeze. This was only possible because of the awesome mapping leads onboard. They were patient in everything they did, guiding me through all the steps and encouraging me to step out of my comfort zone. If it weren't for them, I would have probably lost my mind by now. For my final project, I will be creating mosaics for the Mussorgsky seamount and the western half of the North Ridge seamount area using the Fledermaus GeoCoder (FMGT). I like to think that this experience has opened up new doors for me. At first I was so set on becoming a marine biologist because it involved the ocean and doing what I love, but now I'm seriously considering other options. What does it mean to be a Polynesian connected to the sea through science and explain it through your own experience? What got you interested in the ocean? For me, personally, being Polynesian is the reason why I'm so set on getting a better and broader knowledge on the science part of our ocean, mainly because so many of our people depend on it as a main source of income and because it's part of who we are. Growing up, I would always hear our elders tell us about how so much has changed since their time. Like how back in their days, there seemed to be an endless supply of fish caught with such minimal effort, but now fishermen have to double their effort in order for them to get the same amount of catch. Another thing that they would always talk about is how our beaches and coast area had so much sand back then and now the waves seem to be crashing right next to our roads and homes. As I got older, I learned about more issues that our island, and probably other islands across the Pacific, were dealing with such as sea level rise, groundwater infiltration, massive coral bleaching, subsidence, coastal erosions, loss of wetlands, etc. The list goes on, and I could probably write an entire research paper telling you about the problems our island is facing, but I'll stop here for now. Just recently, I did a research project on the rising sea level of American Samoa, and I discovered that by 2100, our waterline would increase by 15 inches. That might not be a big number for most countries, but that's a drastic increase for us, especially since our island is already slowly sinking. So I guess you can say that all those issues and many more are what ignited my passion to understand our ocean through science. Who else would be more motivated to learn more about the ocean than the people who are most affected by it? What led you to study marine science at ASCC? Originally, I wanted to pursue marine biology, but ASCC does not offer that program, so I settled with marine science instead, but both share distinguished similarities. Why did you apply for EiT? To be honest, I only applied for this internship because one of my mentors, Kelley Anderson Tagarino, told me to give it a shot, and goodness, I am so glad I did. This has definitely been an unforgettable and rewarding experience for me. I only hope that my being here will inspire our younger generation to pursue these opportunities in the field of science and not limit themselves to certain options.